In 2002 I started working as an apprentice for internationally renowned jewellery company, Ola Gorie, back home in Orkney - a small group of islands just 6 miles north of Scotland. 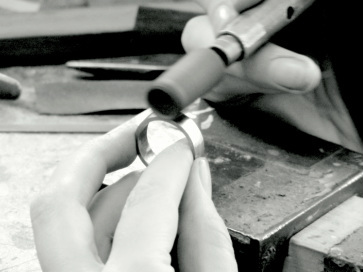 Since then, I have worked and developed my skills with fantastic jewellers both in Orkney and Aberdeen, Scotland. After creating a few custom pieces for friends and family, I decided it was about time to reap the benefits of my skills and set up Nicole Ferguson Jewellery. I now design and hand craft jewellery from my small studio workshop in Aberdeen. I love to make bespoke pieces in silver and gold, and create interest using different tones and textures as well as adding a splash of colour with enamel or gemstones. I also work as a bench jeweller for an antique jewellers based in Aberdeen city centre; working in repairs, bespoke jewellery, wedding rings, fitted bands and restoration. I also make custom items and work in repair and alterations so feel free to contact me with any queries.